Jeremy Bolm of Touché Amoré has posted two studio updates on his Youtube channel. In addition to these videos, Jeremy is periodically posting the lyrics to Parting the Sea Between Brightness and Me, the band’s upcoming album. The lyrics to these songs can be read on Jeremy’s Tumblr page. 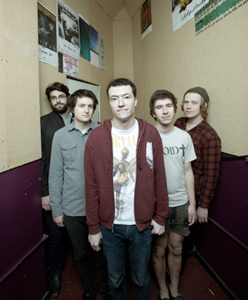 Touché Amoré recently finished recording the followup to 2009’s …to the Beat of a Dead Horse. The band also announced a US tour with The Menzingers, Title Fight,Dead End Path, and, on a few select dates in California, Shook Ones. Click “Continue Reading” for the dates. This entry was posted on Monday, February 21st, 2011 at 7:28 pm	and posted in News. You can follow any responses to this entry through the RSS 2.0 feed.